great happiness: feelings of great happiness or pleasure, especially of an elevated or spiritual kind. something that brings happiness: a pleasurable aspect of something or source of happiness. enjoy something: to delight in something. Joy is what I experienced when I tasted these little bites of heaven for the first time. Fresh coconut and toasty almonds. Rolled in a silky textured chocolate ganache from the gods (actually from Ina Garten but seriously, isn’t she a cooking goddess?). 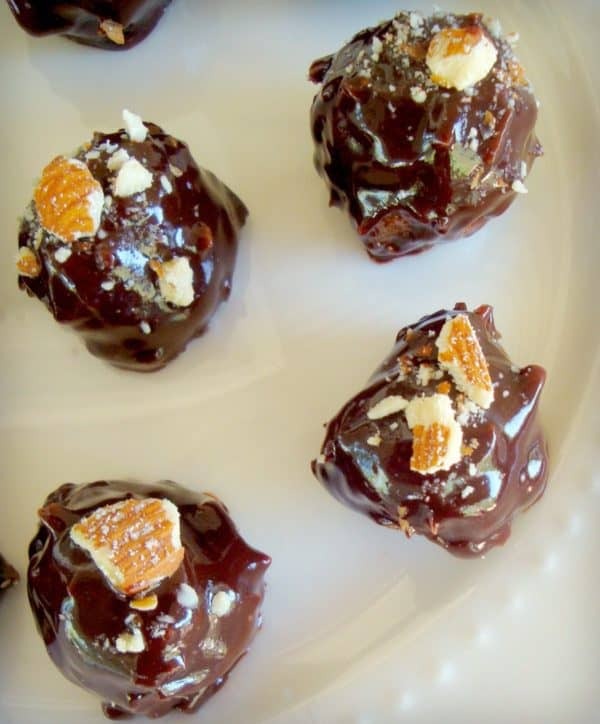 If you’re a fan of Almond Joy candy, you will love these even more! Deliciously fresh with luscious coconut taste and texture. Forming the balls will go quickly if you have a small cookie scoop to help with the process. The ganache is richly decadent and a perfect compliment to the coconut and almonds. After assembly, place in refrigerator for at least one hour before serving, but 24 hours is even better. 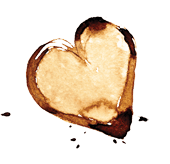 To toast the almonds: Preheat the over to 400. Spread raw almonds on a baking sheet. Bake for about 6 minutes. Cool slightly and chop. Now line baking tray with parchment and set aside. Chop the coconut flakes a bit and add them to a large bowl. Add sweetened condensed milk and vanilla to the coconut, mixing well. Form balls with the coconut mixture, pressing them together HARD. This step is rather messy and a bit time consuming. If you can, use a small sized cookie scoop to speed the process. 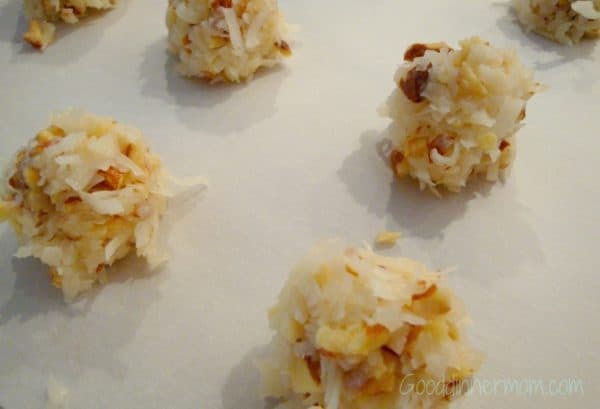 Arrange the coconut balls on the parchment paper and chill one hour. 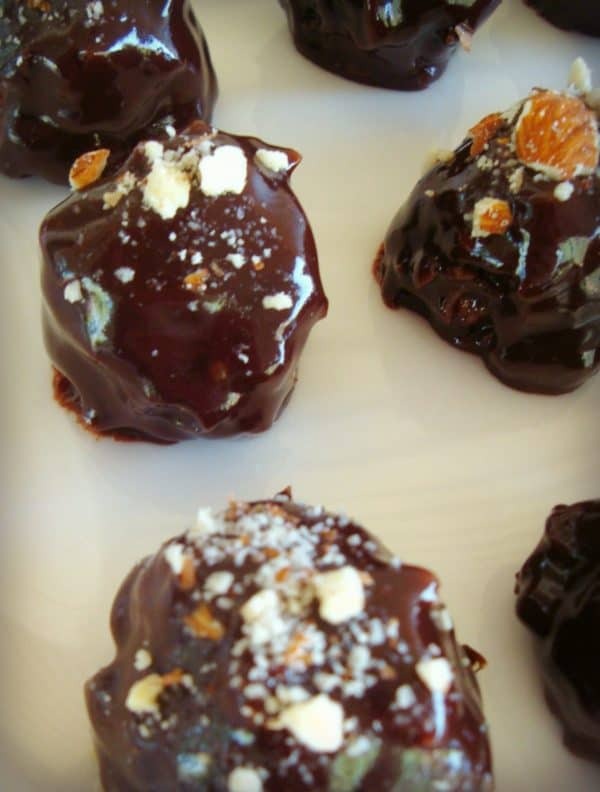 Remove balls from refrigerator and roll each in ganache and place back on the parchment. Sprinkle with additional almonds if desired. Keep refrigerated until serving. Best if made the day before to give 24 hours to chill but may be served as soon as 1 hour after chilling. Husband loved these!! I’m not a coconut fan, but if he likes them, then it’s a recipe worth keeping! !